In order to cut through wood, you have to utilize a coarse blade (with not more than15 TPI or Teeth per Inch) because it removes the material fast to allow for a straight cutting line. Also, course blades frequently fit the bill in terms of wood cutting. But if you have to cut curved lines, then you have to have blades with more than 18 TPI, but remember that they are slower. When you cut through metal, you need a strong blade that is constructed from high-carbon steel because that will enable cutting through nonferrous or non-hardened metal easily. The ideal coping saw blade would be made from a tungsten carbide-encrusted wire if you want to use one for drain openings or ceramic tiles. To cut through plastic easily and smoothly, we highly suggest that you use a helical-tooth blade. It isn’t too fancy, but it does well for such material. The BAHCO 301 is on top of our list. I was immediately hooked to the tool at first glance. It features a nickel-plated frame, providing the durability and robustness of steel along with rust-resistant properties of nickel. I like how several stainless steel varieties can’t be heat-treated for strength, so this heat-treated steel frame indicates that you can buy the best coping saw – both corrosion-resistant and durable. The features make the BAHCO 301 a complete success because it is one of the strongest and most durable coping saws available on the market. What’s truly unique about the product is the Interchangeable blade fitted with retaining pins which is turnable at 360 degrees, making it ideal for different woodworking tasks. Such dynamic functionality and user-friendliness when it comes to changing the blades are the reasons why so many customers love this product. This model looks simple, but it stands out in terms of performance. The product will surely stand up to wear and tear, and it also comes with an excellent blade; that’s why it’s #1 on our list. The GreatNeck coping saw is #2 on our list because it is worth the price for anyone looking for a sturdy and effective tool at a cheap cost. Its strong, steel-made frame is covered in polished plating for further rust resistance, which is a great addition over other similar coping saws. I really love that the saw’s blade can be adjusted easily and rotated for many uses, and it is thin for intended for contemporary crafting. The wooden handle is user-friendly with a feeling of ease and comfort. The coping saw can make six-inch deep cuts, enabling you to cut more on your material. And the best part of it all is that the product is very affordable. Although second on our list, the product is an excellent and durable cutting tool at a very affordable price, making it #2 on our list. 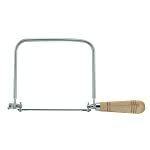 The SF63510 Coping Saw by Olson is third on our list. The reason is attributed to its hard-wearing materials, well-built frame, and different functionalities. This durable saw includes a sturdy frame, wherein you can tension a 6.5-inch blade at both ends using 2-thumb screws. The handle is constructed from hardwood, permitting you to hold the saw firmly as you use it. 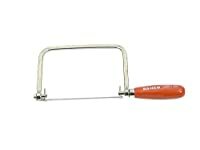 The coping saw is ideal for woodworkers of all kinds because you can turn the blade 360 degrees in any direction you want, hence, allowing for either push or pull stroke cut. Within the box, you will get the frame (constructed in India), together with the 15 TPI blade (made in the USA). What we like in this coping saw is its user-friendliness when it comes to changing the blade because of its thumbscrews as well as its smooth handle that provides a comfy feeling while cutting wood material. The 540-2000 Coping Saw by Robert Larson is another user-friendly tool in this list. The wooden handle is perfectly-shaped, which can be used to change the height of the handle while the frame enables blade rotation and accepts any kind of them, and even includes those with pins. 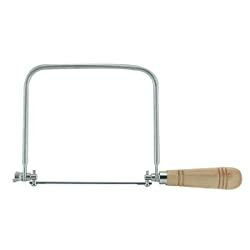 The coping saw constructed from sturdy materials and is intended to last longer than usual. The blade is delicate and thin but strong and very sharp, which allows you to continue any precise and beautifully made woodwork around your shop. Also, you can cut 5 inches easily as for the blade’s depth capacity. In general, this blade is a high-quality, German-made coping saw that is worth the price and that delivers what exactly is advertised. 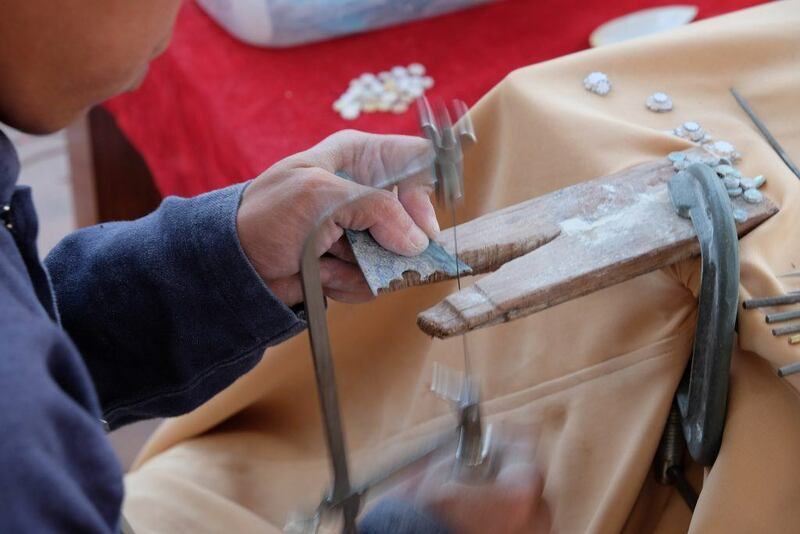 It is ideal for dovetailing as well as several lovely crafts. • Made from durable material. • High tooth count for better cutting. • Excellent depth, giving you more cut. • Ergonomic plastic handle for easy handling. 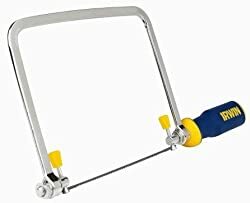 For the money, the ProTouch 2014400 by IRWIN Tools is the best coping saw on this list. The model comes with the biggest depths at 5.5 inches, or approximately ¾ inch deeper than the majority of coping saws. It comes with a 17 TPI blade, rather than the 14 TPI standard, meaning you will have easier, quicker, and a lot more precise cuts. Also, it is one of the cheapest models on this list, which means that you get these features for a cheaper cost than the majority of other coping saw models. The model features a durable steel frame, but it’s untreated or even nickel-plated, so it will ultimately corrode. Also, it comes with a plastic handle, which is a lot easier and more comfortable to utilize, yet becomes less durable over time. If the handle break, then you may need to dispose of the entire saw, so this is a disadvantage you have to consider before purchasing. The product is well-built. It comes with a better blade and greater depth compared to other models for a reasonable price, which makes it a good value. When purchasing a coping saw, its frame is just one of the parts, but the most important one. While are often very cheap, you may want to ensure that you buy the one that will last a long time. Buying a $1 coping saw may be a good deal, but if it lasts for months only then you’d want to a $20 one, which can last for years! One great way to figure out how long coping saws can last is to think about which materials its frame is constructed. Coping saws can go through loads of stress, and also require its flexibility to continue to remain to function well; this means corrosion-inducing factors that wears and tears the saw can be a huge problem. Perhaps, the best material manufacturers use for their coping saws is nickel-plated steel, which combines the natural corrosion-resistant properties of nickel with the steel’s strength. Yes, stainless steel is great, but it will not do as great as coping saws made with nickel-plated steel. There are bare steel tools available in the market, but always be careful when buying them. If they corrode easily – like steel – then this tool may not last long, particularly if your location’s climate is humid. Also, frame depth is another factor you ought to consider. Often, coping saws comes with a certain frame width – approximately between 4 and 6 inches. Deeper frames can cut a piece deeper. While there is a correlation between the coping saw’s depth and price, it is not as concrete as you think. You should constantly check that you are getting your desired frame depth before buying. Fortunately, one good thing about buying blades is that you’re not just stuck with the one you bought with your coping saws. Coping saws make use of a standard-size blade, meaning you can cheaply and easily change a blade for another made from a different company. In general, take note that those with only a few teeth cut quicker but with thicker curves. Our number one model is the BAHCO 301, with an excellent, versatile coping saw and sturdy parts that will last long. It is also the favorite among customers. Second on our list is the GreatNeck Coping Saw, because of mostly its sturdiness, dynamic functionality, and affordability. It stands out among the best models at an affordable price. The Olson Saw SF63510 is one of the most dynamic coping saw; the model is made from heavy-duty materials and features the best blade you can get out there, which means that the model offers the best value for your money. We also have the Robert Larson 540-2000 that looks nice but delicate blade and a few manufacturer flaws. Last on our list is the IRWIN Tools ProTouch, which is a study material and affordable price has one of the deepest cuts, making it great for heavy-duty work, although there have been a few issues with its cheap look, making it unappealing to many customers. We hope that our guide and review aided you to learn and understand what factors to check when buying a coping saw. It isn’t easy to look for quality materials online, but with this review, you should be able to locate and purchase the right coping saw for your needs.